- What do we have a right to know? - What do we do with that knowledge? While I briefly flirted with the idea of imitating Russell Brand’s call for social revolution – even reaching a new all-time-best 10 days without shaving – you will probably be pleased to know that I have in fact settled for fanciful prose rather than political polemic, and the tale of Daniel Farndon’s desperate search to uncover the mystery behind his wife’s death is (thankfully) mere fiction. What exactly did we have a right to know? Devastated by the news of his wife’s death, Daniel Farndon is convinced that the crash that killed her was no accident. His determination to discover the truth uncovers more than he could have ever imagined, exposing a world of deception and corruption affecting the whole of society. Armed with revelations from beyond the grave, Daniel is left with one final challenge to face: what do you do with the knowledge you have gained? A Right to Know is the gripping story of one man’s struggle for the truth and a moving portrayal of a relationship revisited and re-evaluated through the lens of grief. Available now on Amazon Kindle – and coming soon to paperback! – A Right to Know is the latest novel from Sam Lenton (author of Accidental Crime and It was the tree’s fault). Not sure if it’s your sort of thing? Then try before you buy with the FREE SAMPLE, available to download to any Kindle app on a tablet, phone or PC. So, it appears there’ll be a new addition to Sam’s Town in just under 6 months. Photographic evidence exists. This is, it seems, actually happening. It’s all a bit odd really. Out of nowhere we’re suddenly rifling through boxes we’d forgotten even existed, clearing a little bit of space here, a little bit of space there – presumably to give me somewhere to hide when the crying (mine or the baby’s?) gets all a bit too much. We’re painting walls and dismantling things like there’s no tomorrow. Saws are out, hammers are misused and kitchen knives are delightfully deployed to carve through whatever unwanted material we can lay our hands on. Apparently we are now at shrimp size. Last week it was lime. In fact, I believe every measurement used to determine the growth has been something edible. Slightly concerning. Still, I prefer shrimps to lime and so I suppose we’re heading in the right direction. When we finally get up to duck size we’ll really be talking. I suppose the big question we’re all asking is, what will this mean for the future of this blog? No? Not even one of you? Well, just in case, be assured that I have no plans to produce a daily record of every development. In fact, I doubt I’ll even stretch to a weekly or monthly report. But every now and again, up I’ll pop and this page will surprise us all with the fact that it’s finally been updated. In other news, it’s exam season and so it’d be nice if those I’ve taught produced something readable. Hopefully they might even cause an examiner to smile and go tick-crazy in a flurry of Sam-induced praise that justifies my existence over the past 8 months or so. That would be nice. Achievement is always nice. As for me, well, I’ve achieved a blog post and that hasn’t happened for a long time, so that’s a metaphorical pat on the back for me. Oh, and I’ve created a baby. At least, I’ve done something to help kick-start a new life and that can’t be too bad, can it? Something tells me it’s not going to be quite as good a year for flags as 2012. Perhaps for just a few minutes, as Sky’s Breaking News banner informs us that Kate has finally given birth after no doubt enduring hours of ‘gruelling labour’ (their words, not mine), we will raise our flags for one final hurrah, clinging on to the spirit of 2012 by our union-jack-painted fingernails. But weeks of overenthusiastic, shoulder-dislocating-levels of waving? I’m afraid I can’t see it. 2013 looks like going down in history as the ‘meh’ year. The year in which we sit around in dusty cafes mourning the loss of 365 days we’ll never have back, flicking through channel after channel in desperate search of five precious minutes of blind 5-a-side football to keep the spirit flowing. No Olympics. No Euros. No World Cup. Not even a Jubilee. Just 365 days of normality. 365 days of life. Stifle the yawn if you can and remember that fridge magnets, t-shirts, posters and who knows what else are providing the solution to our national stupor: When all the light seems to have gone, Keep Calm and Carry On (italics, capitals and the opening phrase are mine – lawyers on standby). Carry on. Continue as before, with a song in your heart and a flag in your hand, and do it with a calmness that will keep the neighbours at bay. Sounds like a plan. Amidst the calm, permit yourself an ounce of excitement that the next 12 months might in fact offer more than expected. 2012 promised much and delivered much, much more. 2013 promises precious little and so just imagine how surprised we’ll all be if something good happens. The re-opening of Woolworths perhaps? The creation of a new business called Banana that wipes Apple and Orange out of the financial fruit-bowl? A new Sam Lenton novel/play/film/blog post? Possibilities abound. If any abound in my direction, I’ll be sure to let you know but for now let me simply bid you a ‘Satisfactory New Year’ and I’ll leave you to put those flags back in the attic for the next 6 months or so. The moment the news comes, you have my permission to go crazy – Olympic crazy, if you will – and risk wrist injury with every fibre of your being as we welcome the Union Jack back into our lives one more time. BREAKING NEWS! 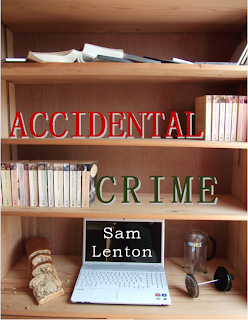 (of the non-Sky variety): My novel Accidental Crime is currently only 99p on Kindle. A complete and utter bargain, even if I do say so myself. Go on. Treat yourself. Tell yourself that Sam says it's OK. And then tell others. There really are no limits to this news. We’ve known for some time that 3 is a magic number. Three wise men. Three lions on my shirt. Three books in the 50 shades of grey series. I’m not sure though that before Barack Obama’s fans crowded the streets of New York chanting ‘U-S-A’ over and over again I had quite appreciated the power of 3 when it comes to a good old-fashioned chant. Sure, lists work in threes but syllables? Who’d have tho-o-ought it? They were some scenes. Let’s be clear about one thing here: this was not a sporting event or even a rock concert. This was an election. You know the one – it’s the thing that about 60% of the British population roll out of bed for every 4 or 5 years, slipping into a secret booth in their local pub to put a large cross next to the person with the most interesting name. The thing we then moan about for months on end as we reflect on the fact that only about 30% of the population actually wanted the party in charge running their country. Three syllables. Three powerful letters. Three good reasons to chant the life out of results day. Eng-land? Oh no, we are En-ger-land. Always have been. Always will be. Is it any wonder O-ba-ma is back in office? Rom-ney never stood a chance. With a Ca-me-ron and a Mi-li-band lining up against each other in a few years, we will at least have an even fight on our hands. Mr Clegg might as well just give up now and join the rest of his one-syllable crowd tucking into a bag of doughnuts while the fate of the government is set without him. As a Len-ton, my hopes of being the subject of (positive) chanting are surely slim and may well be reason enough to not even consider running for PM. With the American election a full 5 days away, why not indulge your democratic itch by voting for 'A True Hero' on the Enter the Pitch website? A few months back, I sat around in a planning meeting and we came up with the plot for a feature film based on the stories of David and Jonathan, Saul and Mephibosheth as found in 1 Samuel 17 - 2 Samuel 9. My role was to then write the script for a 2 minute trailer before passing on to Demelza Jarrett and others to make this a reality by filming and editing something that would meet the criteria of the competition. Well, we have now made the long list and would love to make the short list too, so why not head on over to http://www.enterthepitch.com/view/a-true-hero/ and vote for 'A True Hero'? My debut novel is out now! © Sam Lenton. Simple theme. Theme images by luoman. Powered by Blogger.